Here is another job that I enjoyed doing. 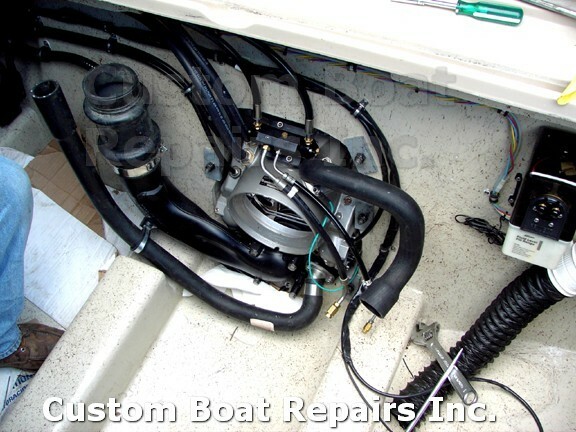 This boat had a gas twin 4 cylinder engine with outdrives mounted to it. The owner wanted to put a single diesel with an outdrive unit on it. 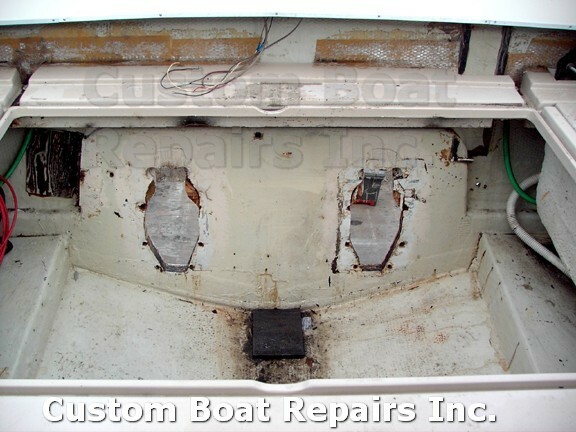 He asked if I could replace the rotten transom and also remove the single engine mounting block and install two mounting blocks for the new diesel motor. 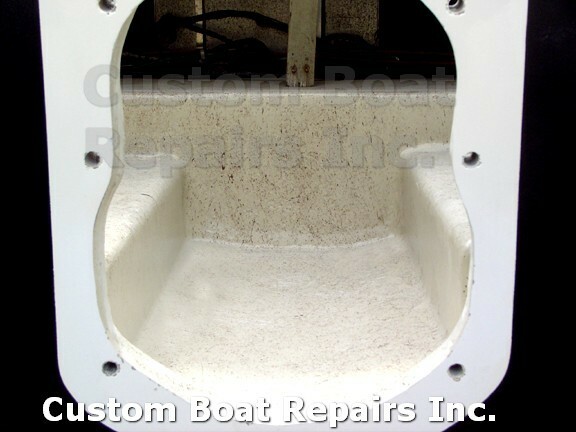 I said no problem, but that the whole compartment had to be reinforced with fiberglass, because the torque from the diesel was a lot more then the gas engines. After the engine was installed the factory representative that sold the engine to the marina went for a test run on the boat. 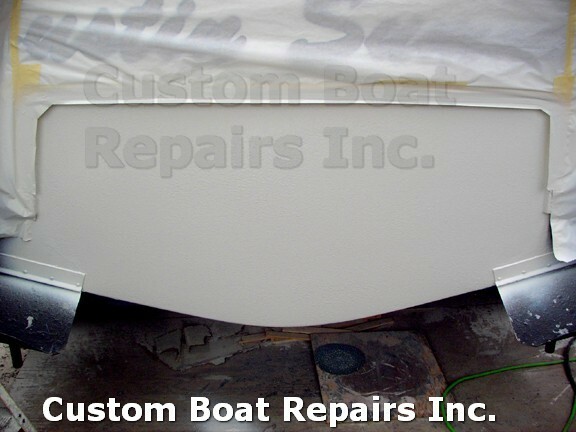 He asked the marina whom did the fiberglass work. 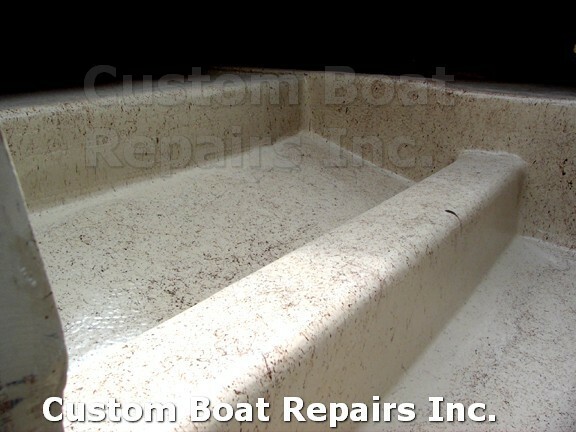 He was very impressed with the fiberglass work and how clean it was and how solid it was when the boat was running. 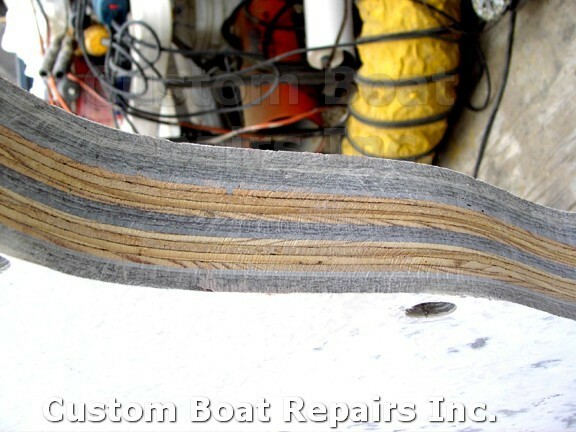 The mechanic that had to cut the opening in the transom for the outdrive couldn't believe how strong & thick the transom was. 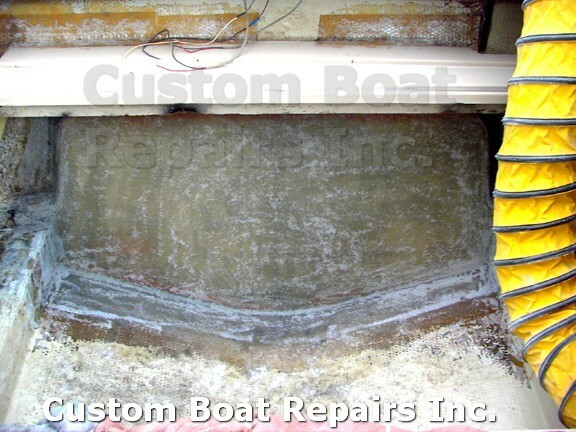 He said other transom you can cut in minutes this one took a very long time due to the multiple layers of fiberglass. 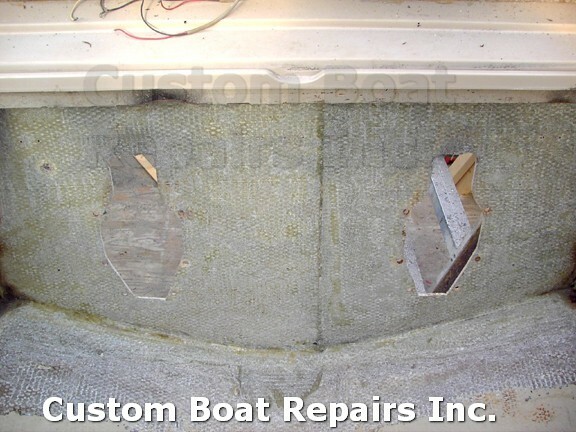 When I replace a transom I put layers of fiberglass in between the layers of plywood. I keep the same thickness set from the factory. I use more fiberglass then plywood. 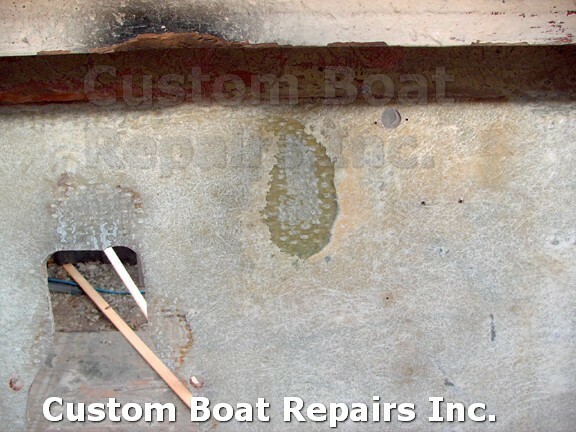 The factory and other repair people will glue two 3/4" sheets of plywood together and then mount that to the transom. 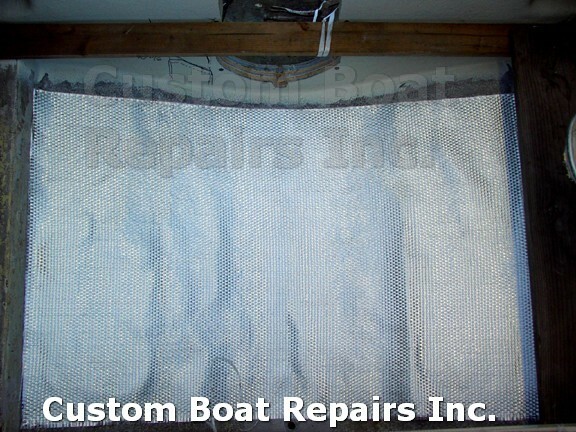 It's quick and easy, but not that strong once you cut the transom. I've been doing transoms like this for over thirty-four years. I have never had one come back to me for rotting out, or falling apart. 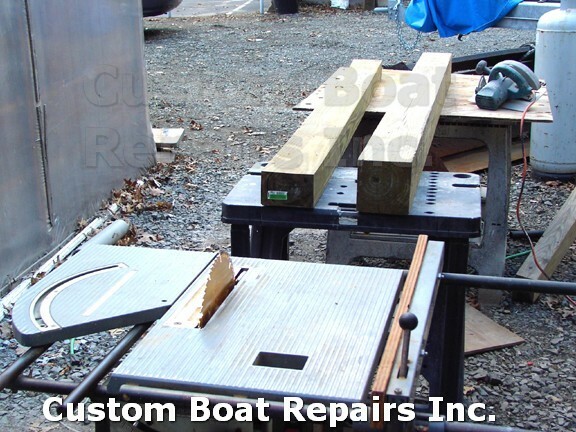 Go thru the photos and you'll see how I built the transom and how I fiberglass the wooden engine mounting blocks to the hull. 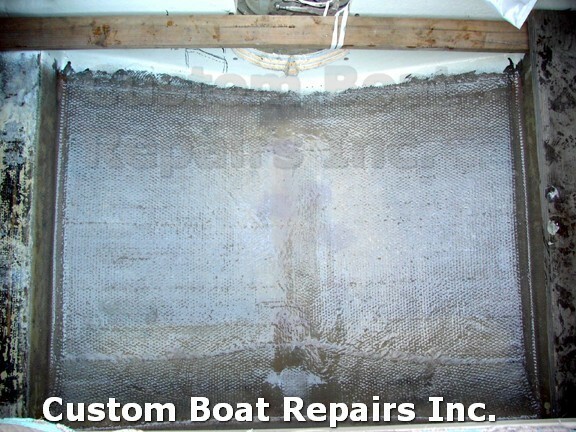 This is how the boat was brought to me. 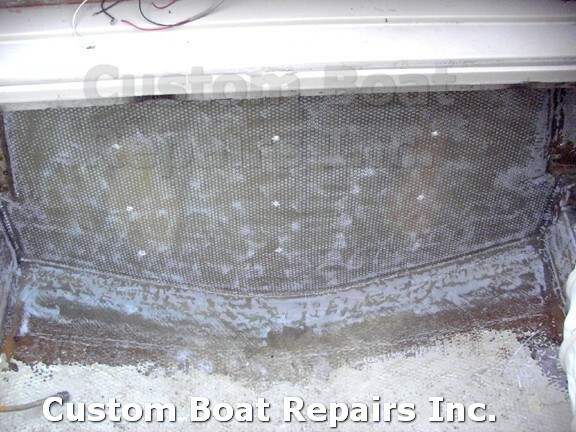 These are the two holes that have to be covered up. This is how the inside looked. 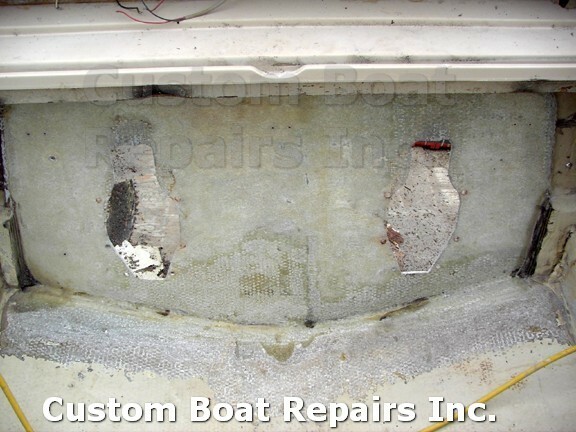 You can see that the transom is in rough shape. This is the single engine-mounting block that the twin motors where attached to. You can see how the alum. 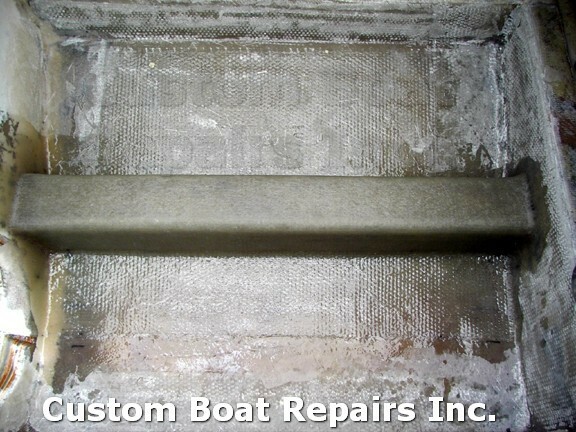 plate was mounted to the transom. Also you can see how the plywood started to fall apart on the upper section of the cutout. 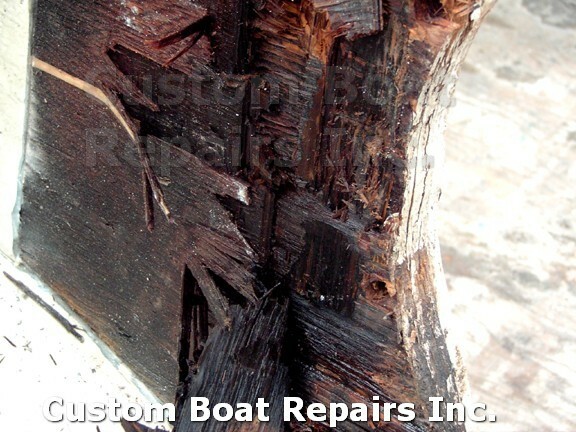 A close up of the plywood rotting. See the water stain marks on the right side of the photo? 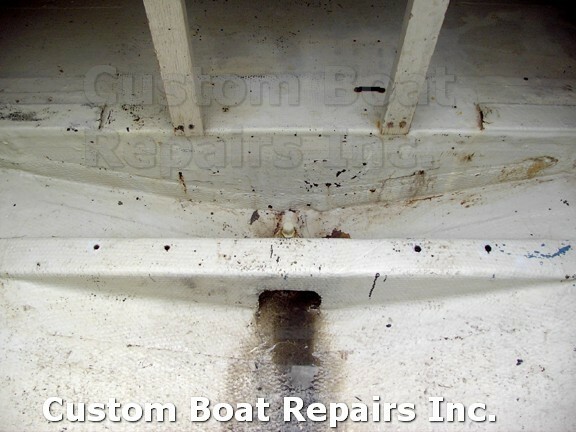 That’s a bad sign if your looking to buy a boat. 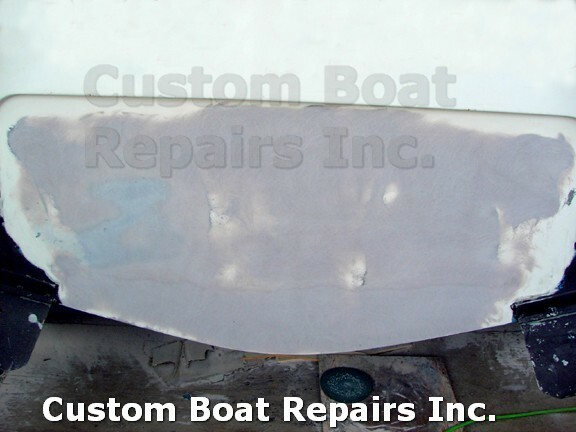 Here I started my cuts and now I’m starting to peel off the fiberglass. Now I’m digging into the wood. This is a close up of the wet plywood. This was dripping wet. This plywood was just crumbling in my hands. 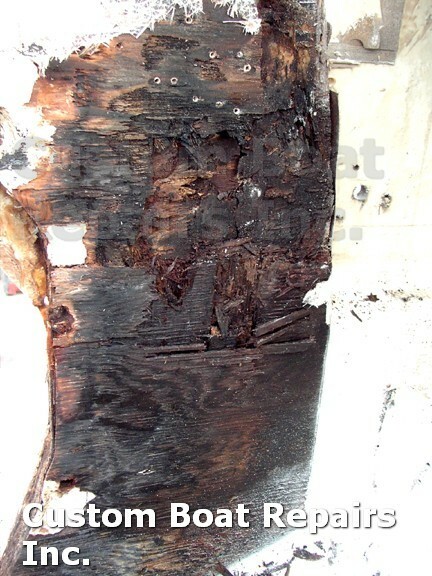 A close up of the rot. 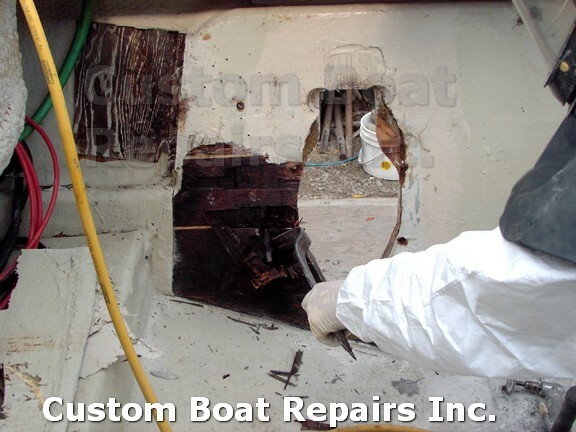 The whole transom being taken apart. 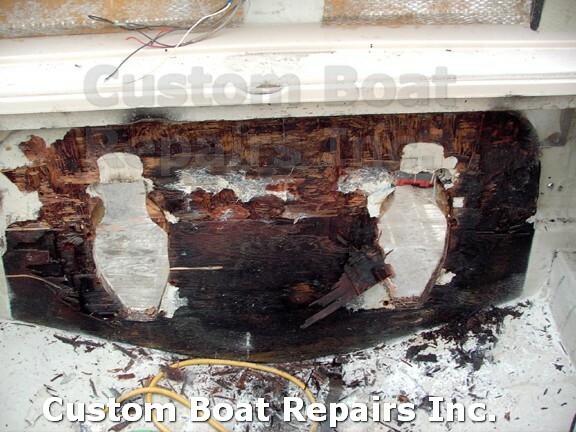 The Plywood is removed, now I have to tackle the fiberglass. 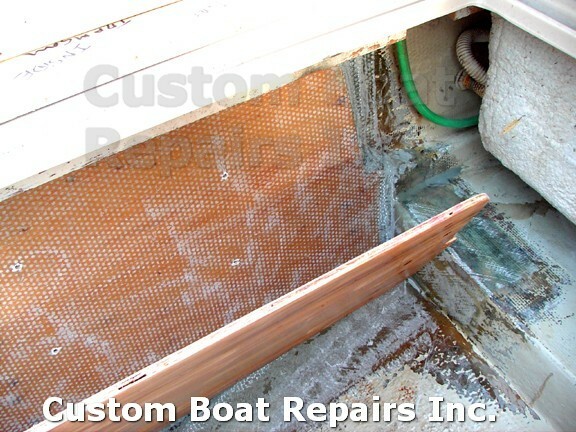 The wet plywood started to work on the fiberglass. 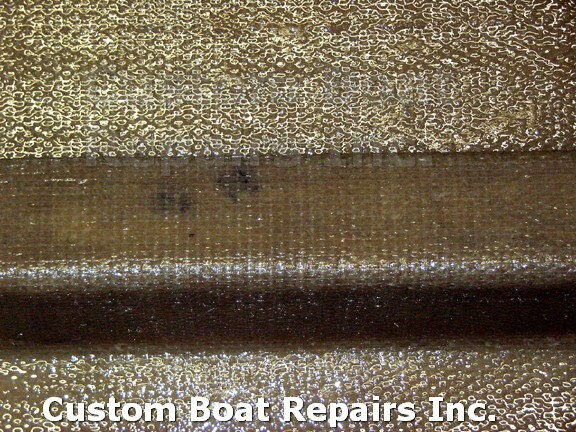 You can see in the upper photo of how the fiberglass started to separate from the laminates below it. Here is a close up of the separation. 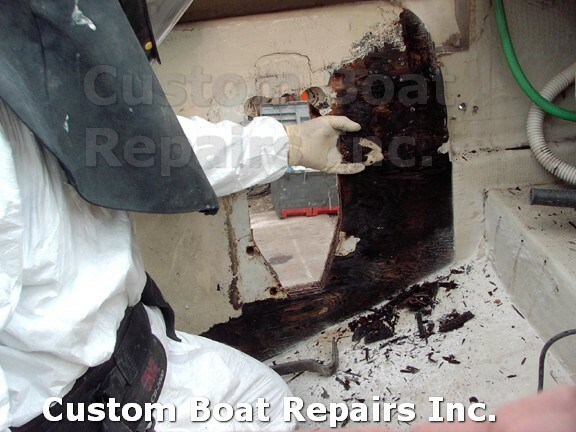 All of this fiberglass has to be removed. 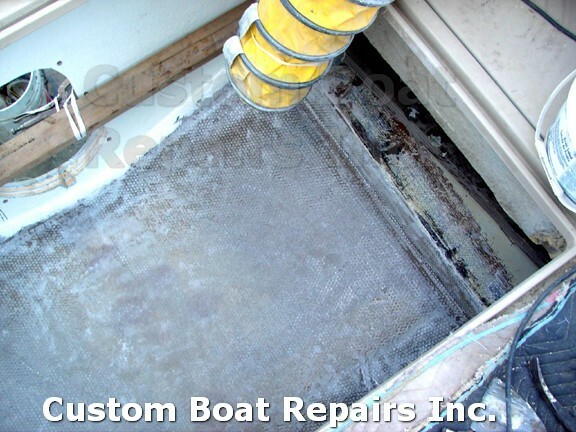 All of the fiberglass is removed to a good base. You can see how even and clean it looks. Infrared heaters are used to dry the area. 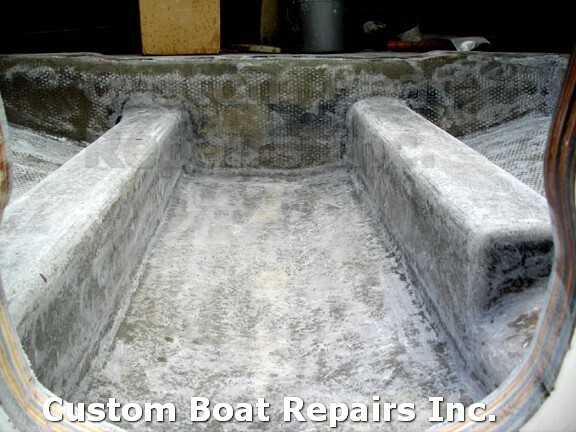 Three layers of fiberglass is applied to the area. 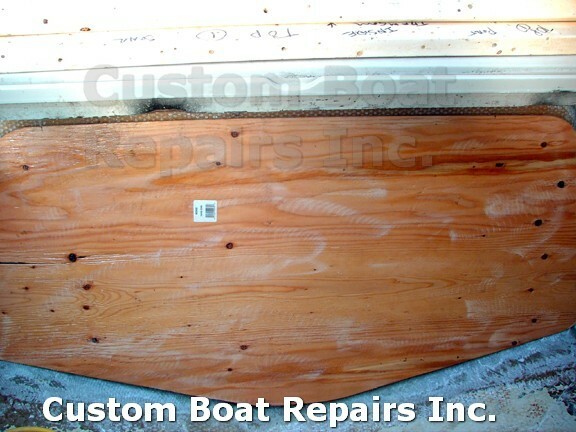 This is the first sheet of plywood for the new transom. 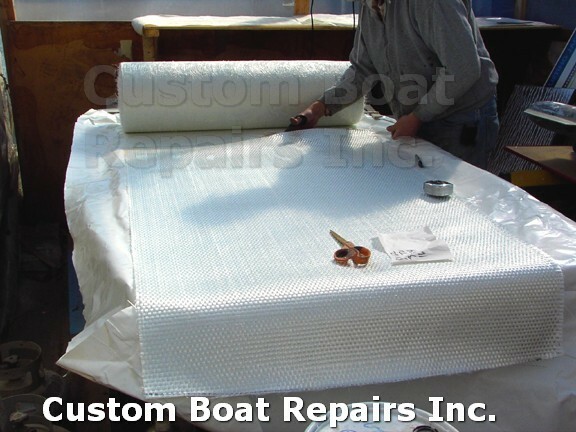 Then I applied three more layers of fiberglass to the first sheet, and I’m getting ready to put the second sheet in place. Second sheet is fitted and set in place. 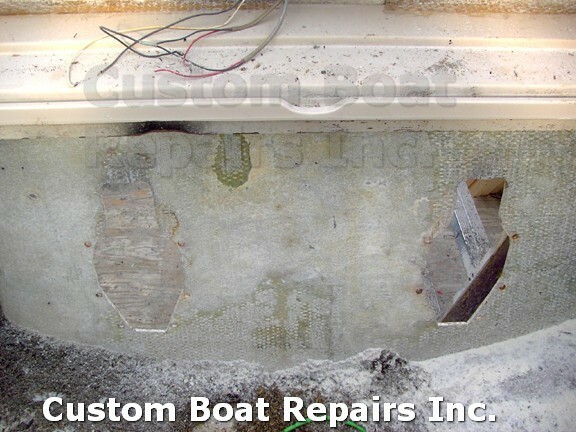 Fiberglass is laid over the plywood and tapered into the hull. Now that’s ground smooth and getting ready for gel-coat. 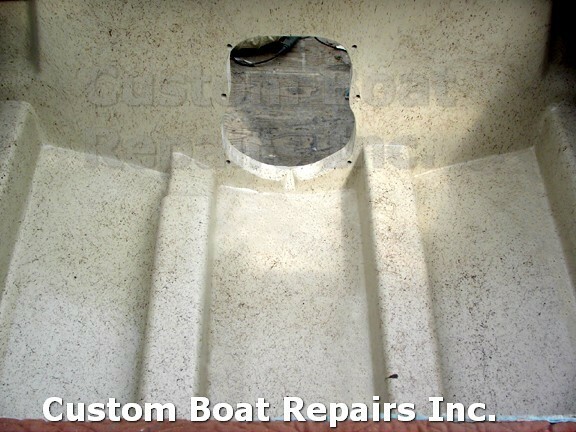 I’m all finish with the inside of the transom. 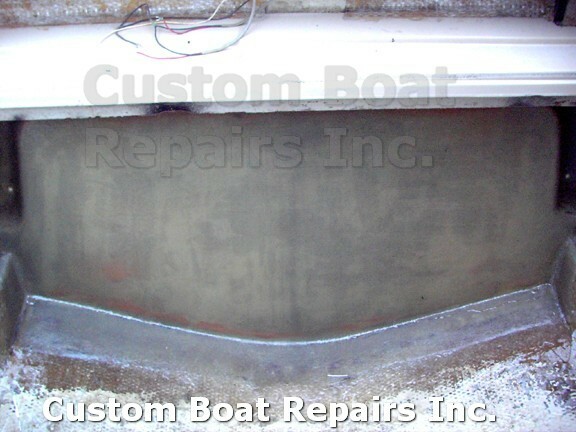 On the outside I fiberglass it and level it off to the original shape of the hull. 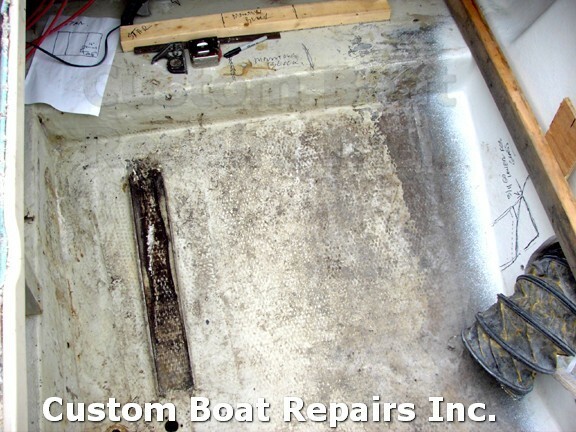 This is a base gel-coat on the transom. 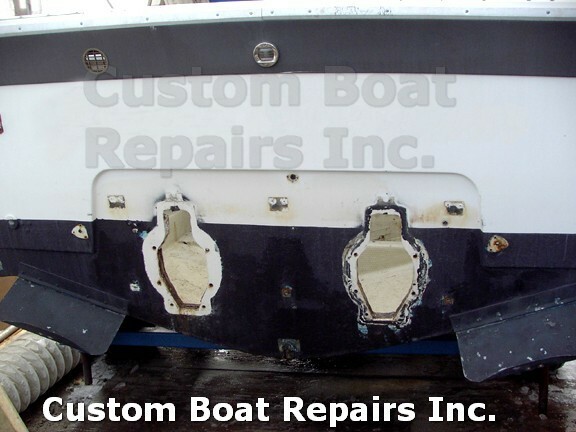 This is what the transom looks like after the mechanic made the cutout. 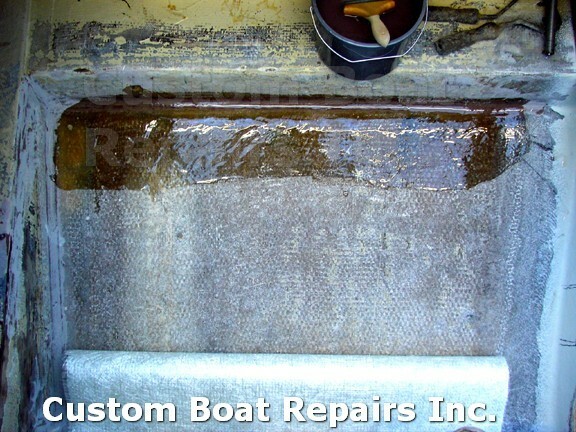 You see how much fiberglass is in this transom. 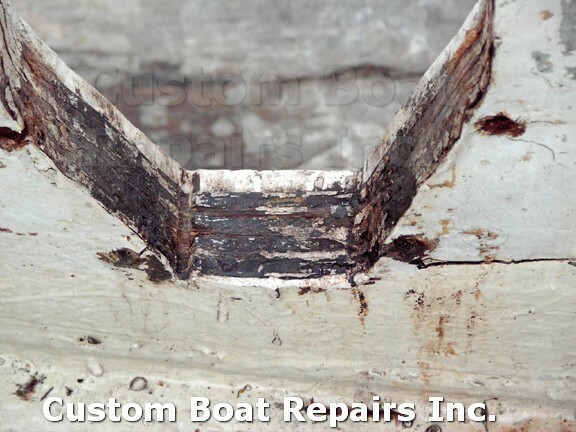 What I like about this type of repair is that if the transom gets wet again from not sealing the bolt holes up the right way,you’ll have the fiberglass in between to give some support, and it slows down the water from hitting the second sheet of plywood. If you have the two sheets of 3/4" plywood together like the factory does, then they get wet all at once. Here I removed the center mounting block. 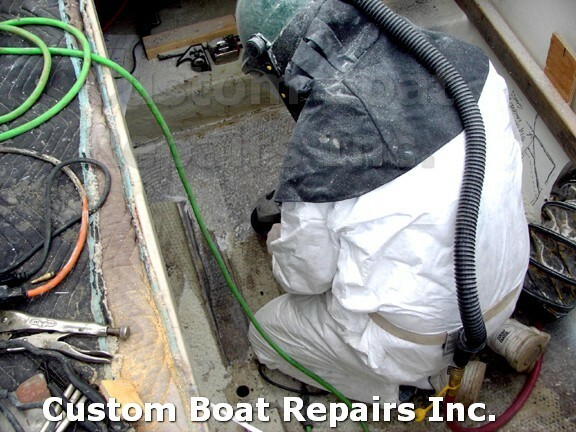 Now I’m grinding the fiberglass in the engine compartment. Looking good. Getting to a good base. 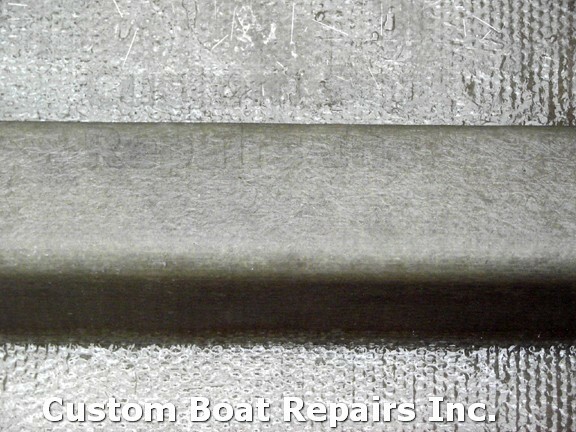 his is what it looks like after grinding it clean. 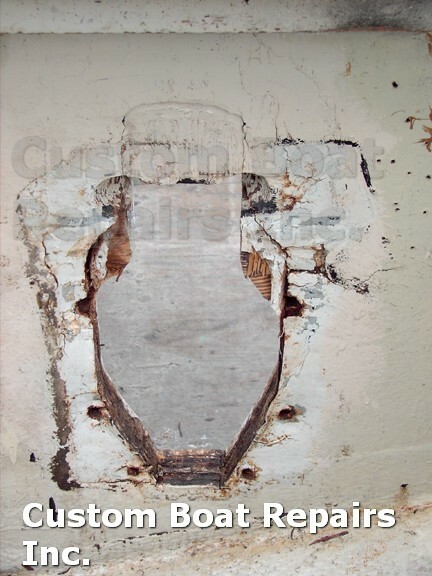 I’ve seen other people do this type of repair to replace the mounting blocks. 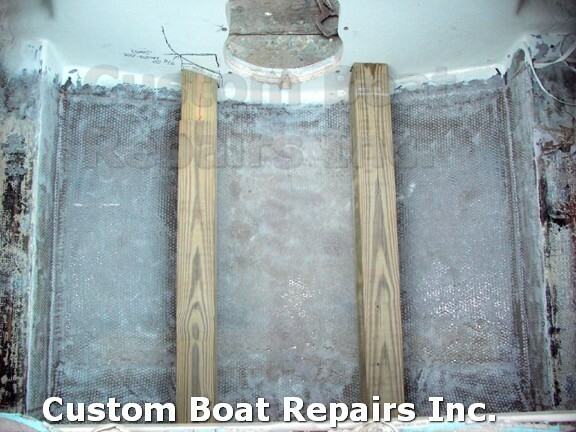 And from what I’ve seen is that they will grind two strips out a little wider then the mounting blocks of the hull and lay fiberglass only in that area. What happens next is that it fails and cracks. 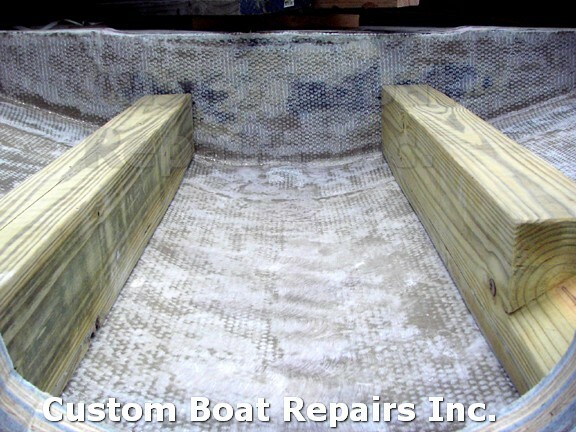 What I do is lay a whole new pan down and attach my timbers to that surface. 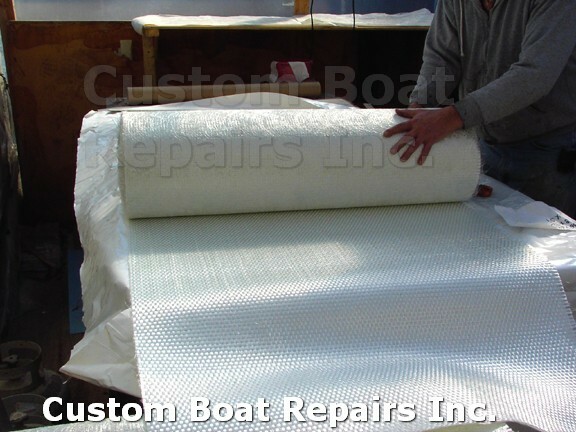 Rolling out the fiberglass that I’m using. 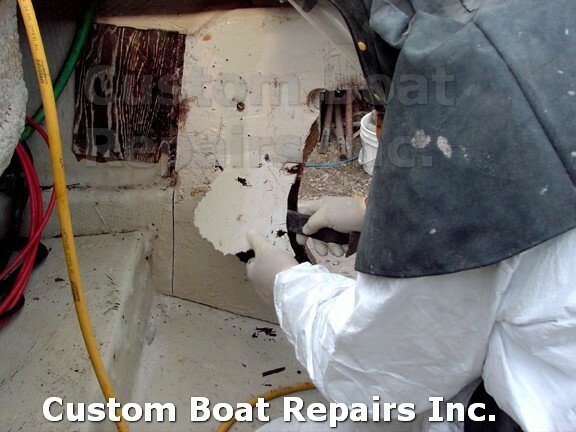 Here I’m cutting up the fiberglass to the size of the area I’m working. Test fitting. And getting ready to lie in place. Starting from one side and working to the other. Looks real good. No air bubbles. This takes a lot of time to get it to look like this. 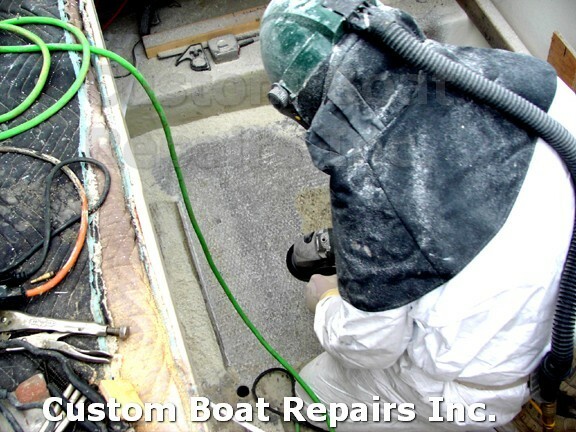 Here I clean up the surface and get it smooth, and ready for the timbers. 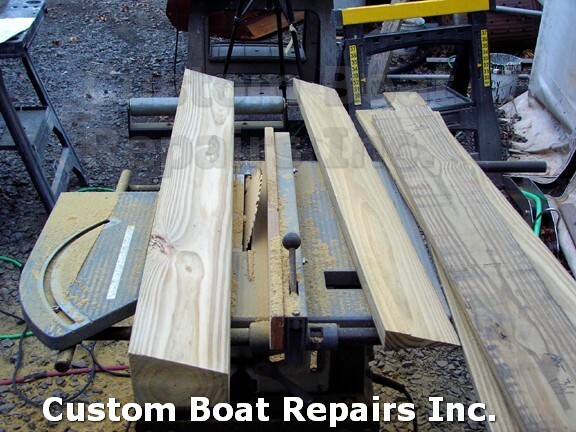 Now I’m working on the timbers that the engine will be mounted too. 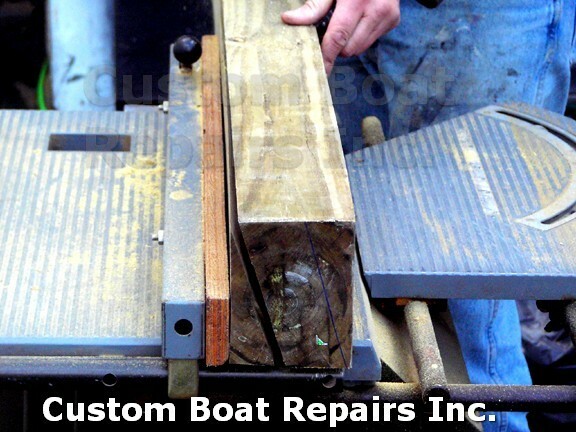 The timbers have to be cut to an angle to match the hull shape. 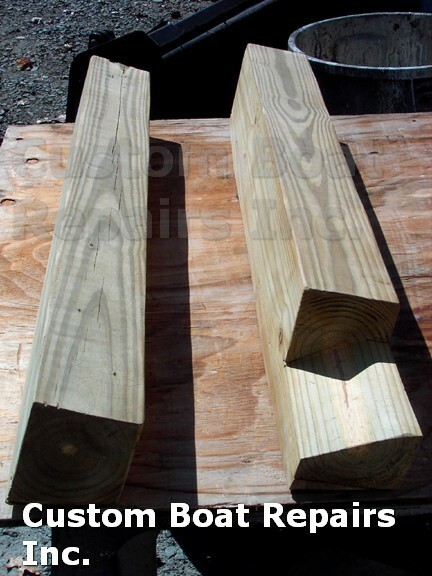 Two timbers where cut up, each one was a different size. This is what they look like after I trim them up and getting them ready for fiberglass. Now I’m setting them in place, making a few adjustments. They fit perfect and they look great. 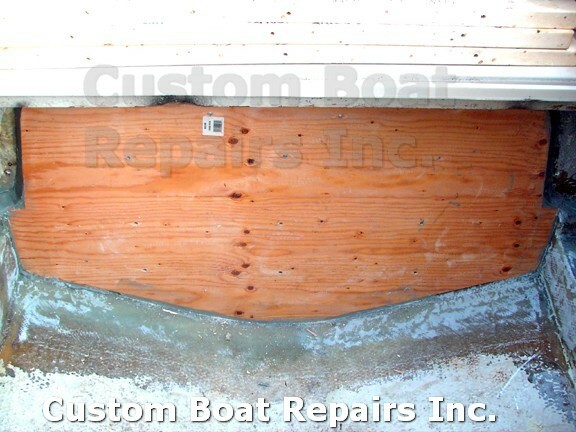 Test fitting the fiberglass that will be covering the timbers. 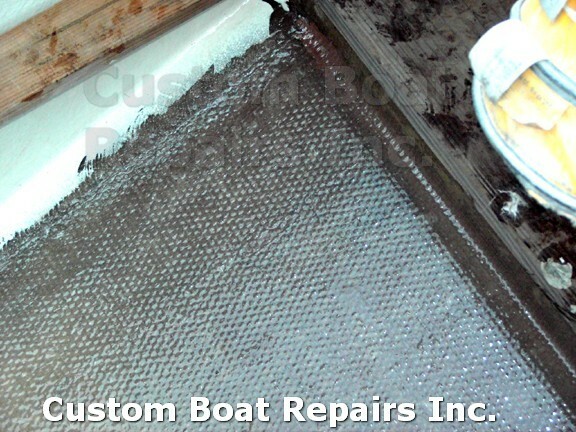 Here the fiberglass is laid out with resin. 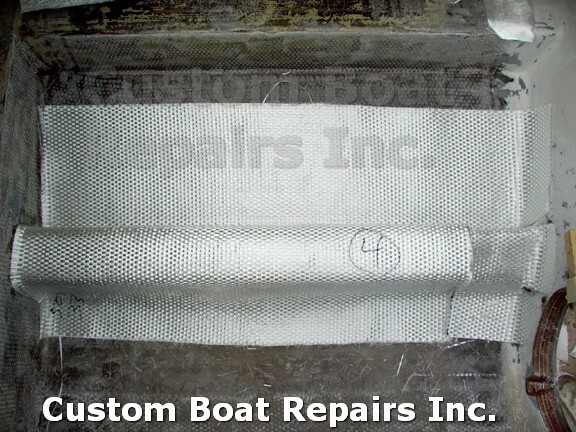 Multiple layers of fiberglass are used. 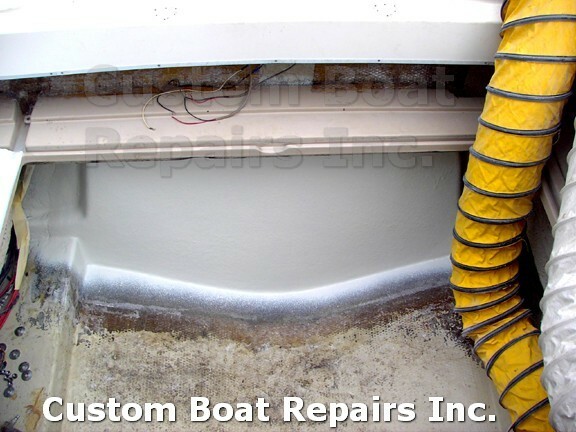 This is a special coating on the fiberglass to protect the fibers strands. 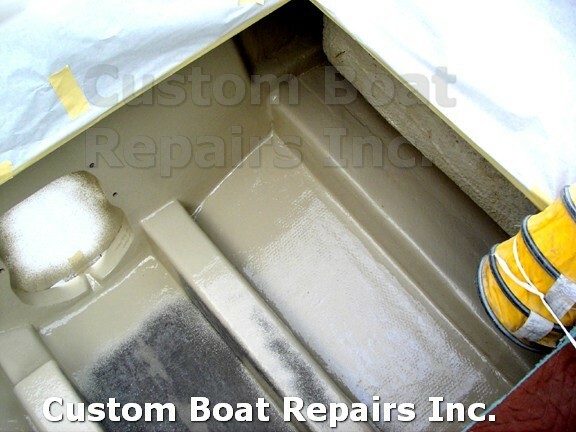 Close up view of special coating. Look how smooth this came out. All done with fiberglassing the mounting blocks. 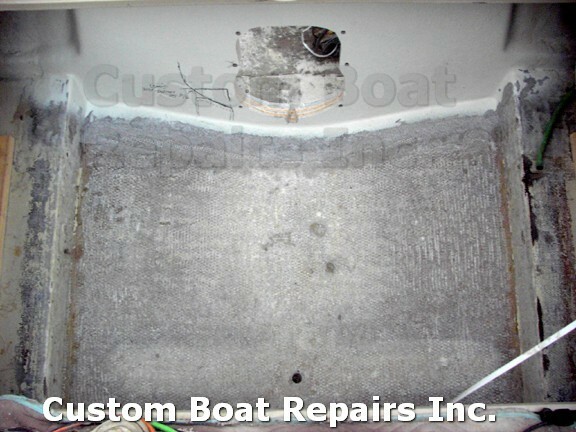 The area is sanded and getting ready for gel-coat. Now I’m spraying the area with gel-coat. 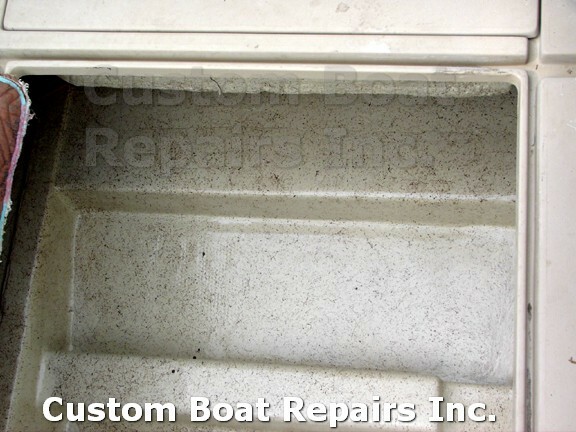 After spraying the gel-coat I applied a brown spider web finish to the gel-coat. It makes the inside look better. This is what it looks like after I spray the finish. A close up of the timbers. 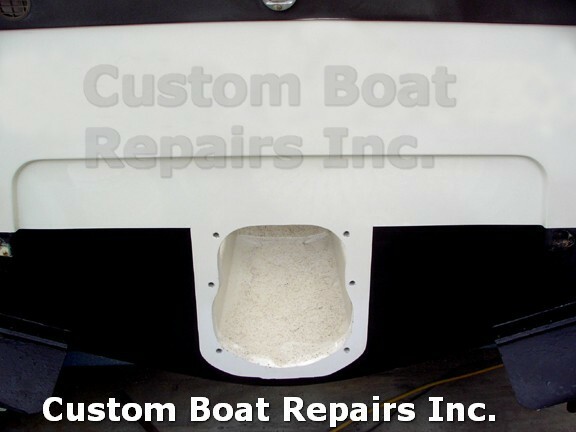 This is the new hole in the transom for the outdrive. Close up view of opening & timbers. 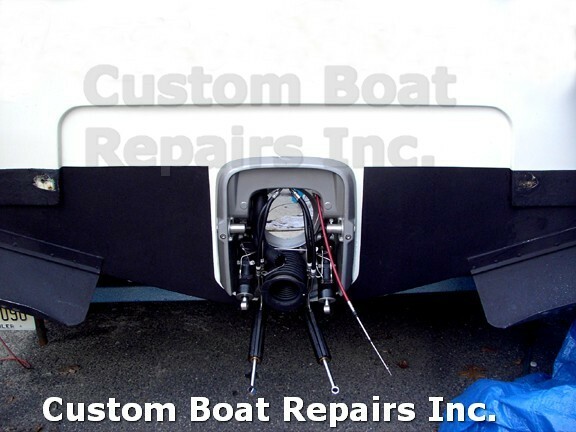 Outdrive unit is attached to transom. Outside view of outdrive unit. 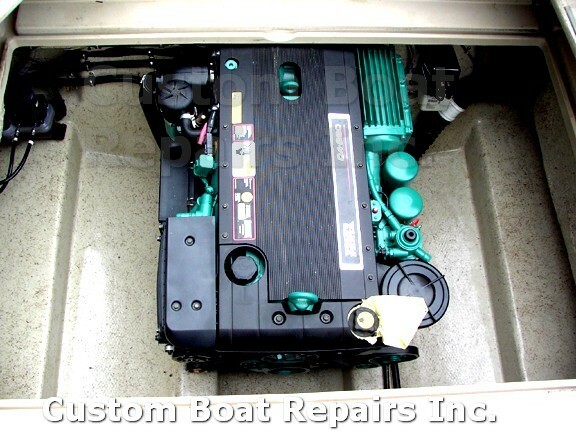 New diesel installed in boat.